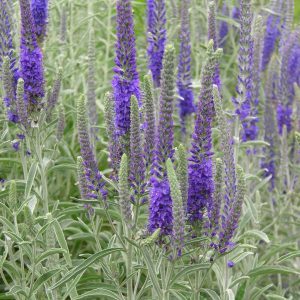 Palest of true blue flowers bloom on 18″ spikes in early summer. Awards: England's Royal Horticultural Society Award of Merit. According to Christian tradition, as Jesus carried the cross to Calvary a woman wiped his face with her handkerchief, leaving the imprint of Christ’s features, the vera iconica, meaning “the true likeness.” When the Catholic Church canonized the woman, the Church gave her the name Saint Veronica. Medieval gardeners named the plant after her due to a perceived likeness of the flower to her handkerchief. V. gentianoides was introduced to European garden cultivation in 1784. Grown in American gardens since 1850. 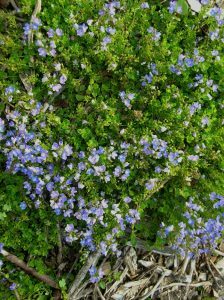 Tiny true blue saucers smother the ground in May & June – groundcover, front of border or rock garden plant. 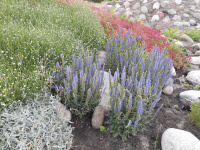 Awards: 1997 Plant Select Winner.